This week alone, online bullion retailer Bullion By Post has received over 2,500 orders as people flock to buy gold at bargain basement prices. 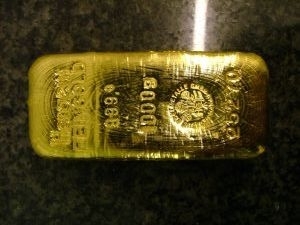 The price of gold fell to a two-year low earlier this week, down 9.2% to around $1,395 an ounce. Bad news if you’re holding onto loads of 'paper gold', trading the stuff electronically, but for those selling cold hard nuggets of the stuff, it’s brought about a sales boom. Entrepreneur Rob Halliday-Stein has been inundated with orders at his online gold store, BullionByPost.co.uk. On an average week, he processes around 600 orders and receives a few thousand visitors to his website. This week, he has received more than 250,000 visitors and 2,500 orders, driving £5m worth of revenue. The phenomenon has brought about the best sales that Halliday-Stein has seen since setting up his business in 2008. But it has also proved very challenging, with the influx of orders playing havoc with logistics.